July | 2014 | The Cool Zone!!! NBA Superstar LeBron James has shook up the NBA world once again. In an very detailed and well thought out essay posted on Sports Illustrated (As Told To Lee Jenkins), “The King” has announced that he is coming home and returning to the Cleveland Cavaliers after leaving them 4 years ago to chase titles with D’wyane Wade and Chris Bosh for the Miami Heat. This move has affected and shifted the entire landscape of the NBA as free agency has been held up waiting for LeBron’s Decision 2.0 and Carmelo Anthony, who still as of now, has not announced what team he will sign with. Cleveland fans are rejoicing all over as this is the the story of legend. The basketball world is buzzing and there could be even more to buzz about in Cleveland as there is speculation that the Cavs are trying to make a deal with The Minnesota Timberwolves to bring Kevin Love to Cleveland making a “Big Three” of their own featuring LeBron, Love, & Irving. 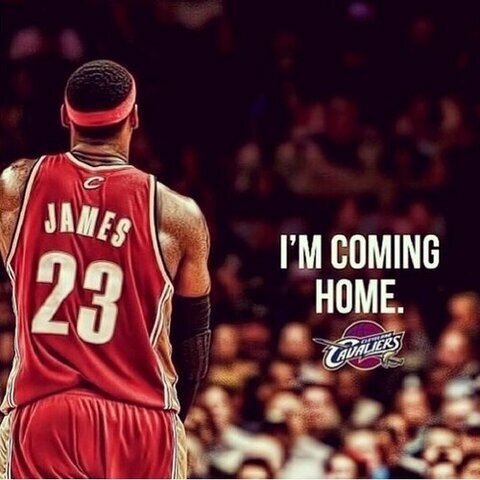 So many headlines and stories will come of this… “The Prodigal Son Returns”, “The Return Of The King”, how will this affect the rest of free agency? How will this affect the landscape of the NBA itself? These questions and more will be asked about LeBron’s homecoming, but the most important story and question will be, will championships come with him? First Look At Superman In Batman v Superman: Dawn Of Justice, Reveals New Suit!!! The first official image of Henry Cavil as Superman in Batman V Superman: Dawn Of Justice has been released and it is AMAZING!!! Cavill has really beefed up to the point he looks even bigger now than he did in Man Of Steel. Superman looks like a complete BEAST!!! Which in combination with the way Ben Affleck has beefed up for his role as Batman has me even more excited for this upcoming superhero smash. In the new picture you can also see some very subtle but noticeable changes to the suit that i think really makes it look new and even better than the Man Of Steel suit. The first thing I noticed was the change in the belt. It’s a rectangular shape now as opposed to the circular one and the color has changed to more of blue/white color. The design around Superman’s wrist and torso area are a bit different and the famous iconic “S” symbol looks slightly different on the suit, perhaps it’s a bit more raised on the chest and the color is slightly altered. All of these changes are subtle but all together they make the suit look so much cooler and better overall. Personally, I’m ecstatic about the new image of Superman and coming off the reveal of Affleck in the Batman suit and how amazing that looked, I’m totally excited for the Batman v Superman movie. In an interview with USA Today, who released the image, director Zack Snyder said “Cavill is definitely more comfortable in the role the second time around…The more time I spend with Henry, the more he’s Superman to me.” And it shows, Cavill looks like a stronger, more confident Supes in the new image. Which can only mean great things for the Man Of Steel on the big screen. Batman v Superman: Dawn Of Justice is scheduled to be released on May 6, 2016.